Junbeel Mela, a kind of trade fair which is the existing witness of ancient Barter Trade system has been started on 16th January, 2014 with three days programmes. 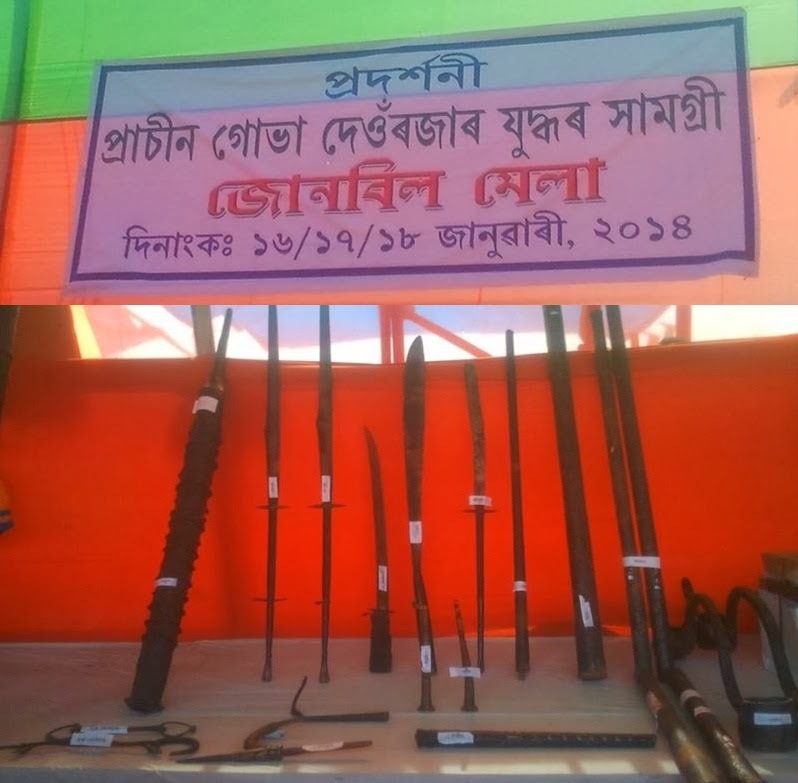 The witness of the ancient Kingdom of Gobha, the live exhibition of the royal cultural heritage of Gobha-Raja, Junbeel Mela has been organizing along the bank of historic Junbeel, near Jagiroad along Jagiroad-Bhakatgaon road towards Morigaon town. So, the ancient barter system again has come into unveil. Practicing this trade system, people living hills and plains come together in unity and wish each other for well-being. Generally, people living in hills, who are coming to Junbeel Mela for participation in the barter trade called Mama to gents and Mami to ladies. The present Gobha King is Shri Dipsing Deoraja and He calls one special Darbar at Junbeel Mela to discuss issues related to celebration of Junbeel Mela and also to have a cordial discussion with the invited guests. The sources state that this time, some distinctive dignitaries are attending in the Darbar including Shri Ramakanta Deori, Chief Executive Member of Tiwa Autonomous Council; Shri Jitesh Khosla, Chief Secretary, Government of Assam; Shri Rajat Gangoli, Director, Sangeet Natak Akademi and some special dignitaries from US Embassy working in India. The organizing committee is planning to publish a souvenir with the title ‘Junbeel’ on the occasion of Junbeel Mela. It is to mention here that the Tiwa Autonomous Council has been developing the place of observation of Junbeel Mela and has already constructed the Welcome Gate to Junbeel mela. Moreover, on permanent basis, one concrete stage and sanitary lavatories have been constructed. Under the aegis of ancient Gobha Kingdom, the Junbeel Mela has been held every year since time immemorial on the bank of Junbeel. The present Kingship of Gobha, the King Shri Dipsing Deoraja has also been putting His full efforts to honour its ancient legacy of Tiwa Kingdom organizing the Junbeel Mela continuously. For organizing the Mela, Gobha-Raja generally forms an organizing committee giving responsibilities. Junbeel Mela is a kind of trade fair, which is a strong as well as existing witness of ancient Barter Trade system. This fair is organized on the extensive paddy fields along Junbeel during festival time of Bhogali Bihu in Assam, which falls in mid-January for two to three days. Located near Jagiroad along Jagiroad-Bhakatgaon road towards Morigaon town, Junbeel is generally a beel (water body), which is used for community fishing on the occasion of Junbeel Mela or Bhogali Bihu / Magh Bihu in Assam. 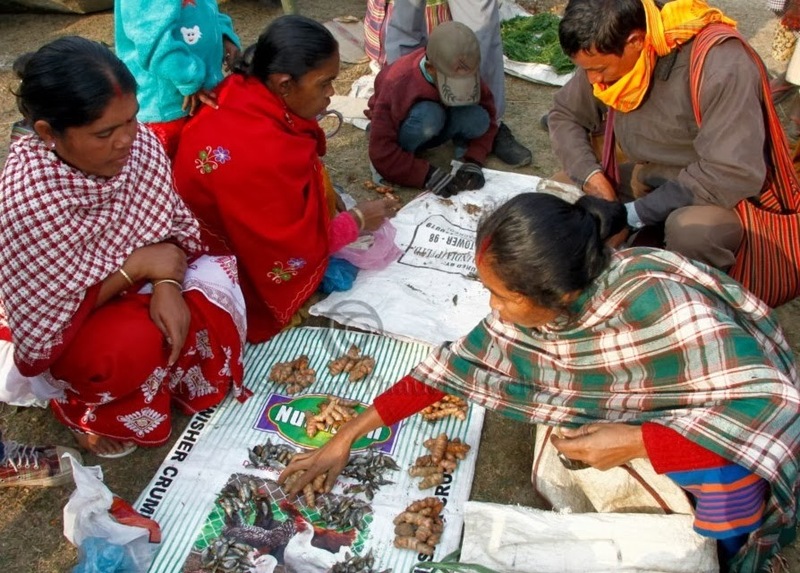 Generally, people living in hilly areas of Karbi Anglong district of Assam and state of Meghalaya come down for exchanging commodities, which is a Barter Trade system, with people living in plains. In this trade practices, edible products are bartered for celebrating the festival. The ancient barter system again, therefore, has come into practicing in Junbeel Mela. People living hills and plains come together in unity in Junbeel. Generally people living in hills coming to Junbeel Mela for participation in the barter trade called Mama to gents and Mami to ladies. 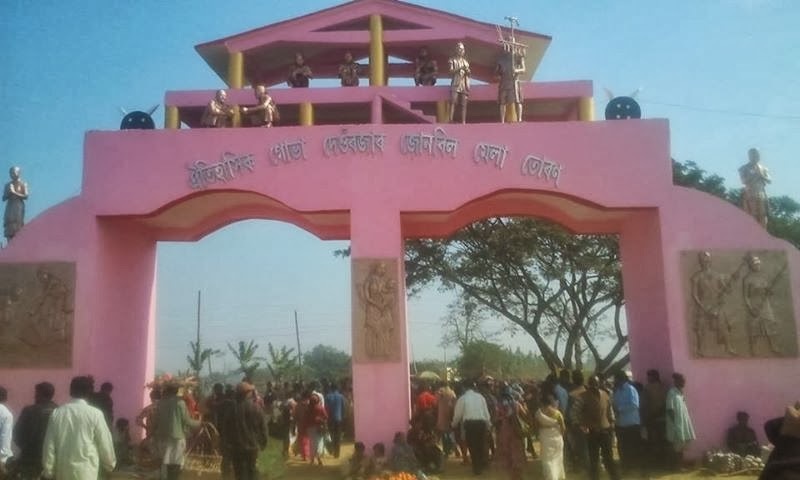 It is stated that the ancient Kings from various kingdoms situated in the ancient Assam namely, Gobha-Raja, Nellie-Raja, Chahari-Raja, Khola-Raja, Kunoi-Raja, Tetelia-Raja, Dimoria-Raja generally participated in the Junbeel Mela. With regard to the tradition, the Bhogali bihu festival is observed according to the declaration of the Gobha King in the area. Generally, Bhogali Bihu is celebrated in entire Assam which starts with Uruka feast on the day before last day of the month of Puh on Assamese calendar year. 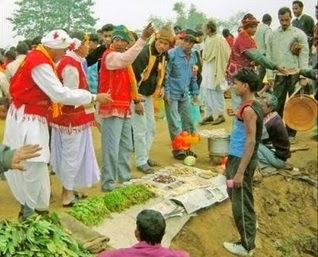 Accordingly, the Junbeel Mela begins on the day before Uruka feast. 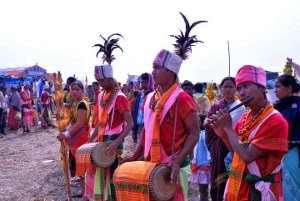 On that day, generally the Tiwa community people living in hilly areas like Karbi Anglong district of Assam and the state of Meghalaya come down to the plains, particularly to Junbeel Mela. 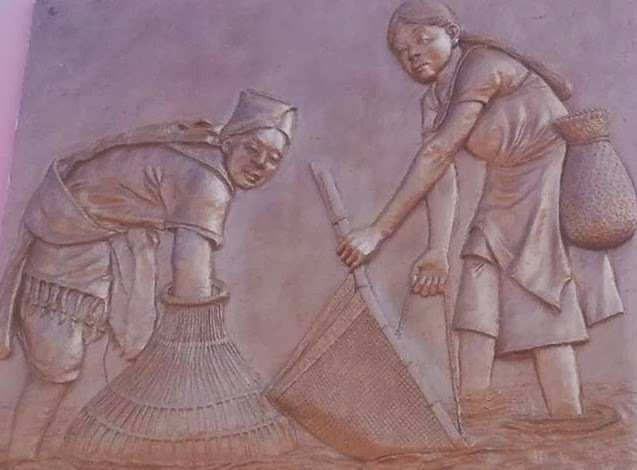 They come here for exchange of food products and they bring their produces for barter with the food products produce by the people living in plains. The hill people bring potato, garlic, ginger, etc. and they exchange these with rice cake, rice powder, sandoh, laddu, fish, etc. In the early morning to evening on the day before Uruka barter trade is performed. After that, the hill people go back to hill and observe Bhogali Bihu on the next day with the food items exchanged. 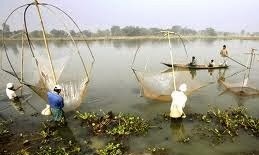 Significantly, the community fishing is an integral part attached to Junbeel Mela. As the barter trade among people of hills and plains comes to be over, the King of Gobha declares permission for community fishing in Junbeel. Generally community fishing in Junbeel is performed upto the day of Uruka. The Deoraja calls a meeting at Junbeel to discuss various important issues including management of Junbeel Mela. In this Darbar, the invited guests are felicitated. A friendship discussion for cordial relationship is held with the other Tiwa Kings and invited guests from various parts of the country and the abroad. On the third day, the Deoraja of Gobha calls the special Darbar arranged at Junbeel. On the Darbar the King of Gobha declares and directs the designated executives of the Kingdom to collect tax from the vendors, merchants coming for sell at the Mela. This particular custom of Gobha King is seen maintaining from time immemorial. In the social formation of the tribal societies like Tiwa, Karbi, etc. the organization like Dekasang plays as a pivotal role in managing social life. Dekasang is called Samadi in Tiwa language, which is generally a place of gathering with some specific purposes. Knowledge on social morals imparted in the meeting held at Samadi or Dekasang to the young people, particularly to the boys. So, only the boys can participate in the meeting held at Dekasang. This social tabo is maintained in the tribal societies at present days also. Samadi or Dekasang has been constructed in the Junbeel also which stands as the traditional practice of the Tiwa communities. During falls winter some migratory birds fly down to the eco-system of Junbeel. The lake like Junbeel is surrounded by wide paddy fields. As the area is based primarily on agriculture, wide paddy fields are used to cultivate rice during summer and also in winter. But in the summer, the flood water of Kolong river and Kopili river generally submerges the Junbeel area being it is a low lying area. Junbeel Mela, held on the bank of Junbeel of Marigaon district is now turned to be the synonym of Rural Tourism in Assam. Every year, this Junbeel witnesses large number of crowd. People from various places of the country visit this place during Junbeel Mela. Junbeel has been turning to be the place of attraction in the international front also. Little has been done, but still much have to be done with regard to organization of Junbeel Mela.